Adolf Loos (December 10, 1870 in Brno, Moravia – August 8, 1933 in Vienna, Austria) was an early-twentieth century Viennese architect. He believed that what is beautiful must also be useful, and linked beauty and utility by returning an object to its true utilitarian value. Adolf Loos also believed the language of the environment of the metropolis was centered in the absence of all ornament. A major characteristic of his private residential works were the undecorated white facades. He also focused on reputing Vienna Succession (a modernist movement led by Otto Wagner), which inspired his most notable essay, "Ornament and Crime" written in 1908, but only published in Western Europe in the late 1920s. His provocative catch phrase, "form follows function,” was taken up by the Modern Movement. He believed that there is a difference between art and architecture, and the only things in a house that belong in both categories are the monument and the tombstone. The house is not considered art because it has to please everyone, unlike art. The fact that architecture is essential and serves, means that it must not be categorized as art. 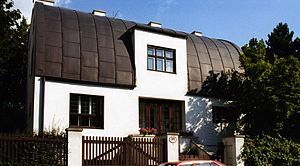 Adolf Loos was born in present day Czech Republic, formerly Moravia, in the town of Brno on December 10, 1870 (though his official nationality is Austrian). The art of building was introduced to him at an early age by his father, who was a stone mason. At age seventeen he started school at the Royal and Imperial State College at Reichenberg in Bohemia. After two years at the school he was drafted to serve one year in the Austrian military. When he returned in 1890 he studied architecture at the Technical College in Dresden until 1893. Adolf was particularly interested in the works of the classicist Schinkel and the works of Vitruvius. A major influence on him was a three-year visit to America which began in 1893. He did not practice architecture there, but observed America’s new efficiency with its growing industries. He started working in the firm of Carl Mayreder when he returned to Vienna. Loos' work, although varied in style, is best known for a period of houses of highly stereometric form and white color. The ornamentation of the exteriors was greatly simplified. The interiors were, in contrast, highly complex spatially and materially luxurious. In 1899, Adolf Loos designed the Cafe Museum, considered one of the most notable projects of his early career, which asserted his developing theories that technique is more dominant than decoration. This was also the start of his movement to support his theory of the renunciation of stylish ornamentation. To him what was beautiful must also be useful. He linked beauty and utility by returning an object to its true utilitarian value. In the Café, the only decorative elements of the interior were strips of brass, which also served as electrical conductors. Another example of his works, the tiny Karntner Bar Vienna (1907), demonstrated his ability to manipulate space, and his fondness for expressing natural materials in patterns. Between 1909 and 1911, Adolf Loos designed and constructed one of his most notable works, the controversial Looshaus in the Michaelerplatz, in the heart of old Vienna. Its design was inspired by the relationship between the historic memory of the city and the new inventive city of modern architecture. Adolf Loos believed the language of the environment of the metropolis was centered in the absence of all ornament. In 1910, a public furor spawned by the simplicity of the modernistic design resulted in a municipal order to suspend work. Construction ceased and building permits were denied. Antagonized by the very modern ideas and designs, the general public protested against the construction of the building. Adolf Loos responded to the 2,000 angry residents at a meeting, ending it with an agreement to add window boxes in an attempt to make the unpopular design more familiar. 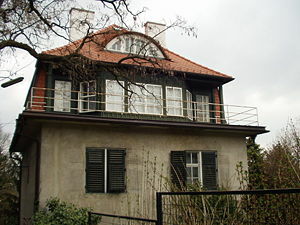 A major characteristic of Adolf Loos’s private residential works were the undecorated white facades. Before being appointed Chief Architect of the Housing Department of the Commune of Vienna in 1922 Loos designed the Steiner House for the Chicago Tribune competition. In the house, he proved that he could be more lenient towards ornament than his peers by integrating large decorative columns, which were only present and therefore beautiful in the fact that they had a purpose. Later that year, Loos resigned as Chief Architect because his opposition to Austrian Marxist ideas was distracting him from his work. In his five-year stay in France, Adolf Loos’s career continued and as he created many important works and contributed to exhibitions at the d’Automne. The Tzara House in Paris (1926-1927), Villa Moller in Vienna (1928), Villa Muller (1930), Villa Winternitz in Prague (1931-1932) and the Khuner Country House at Payerbach in lower Austria were all created in that time period. They each had a style that was indifferent to the current taste of architecture in the 1920s, and which reflected Loos’s own feelings about styles of the time. In 1930, Adolf Loos was recognized as a Master of Architecture and was awarded an annual income by the president of the Czechoslovakian Republic. All the essays and literature that he is best known for were published in 1931. Adolf Loos died on August 23, 1933 and was buried under a tombstone of his own simple design. Adolf Loos expressed himself strongly through writing. He is probably more famous for his opinionated literature than his architecture. He started publishing his thoughts in 1897 in the The Neue Freie Presse of Vienna. His topics did not focus on architecture but more on the flaws of society, which were the cause of much suffering in the lives of ordinary people, a subject which appealed to the middle class. Adolf Loos continued to comment that the true nature and beauty of materials was covered up by useless and indecent ornament. In his 1898 essay entitled "Principles of Building," he stated that the integrity of architecture lies in the materials themselves, and that a building should remain "dumb" on the outside. Much of his architectural work had a way of balancing the blank exterior by exaggerating interiors. He also focused on reputing Vienna Succession (a modernist art movement) which inspired his most notable essay, "Ornament and Crime" written in 1908, but only published in Western Europe in the late 1920s. His provocative catch phrase "form follows function,” was taken up by the Modern Movement. He also declared that a lack of ornament signifies spiritual strength. When he visited the United States during its Industrial Revolution, he realized that the most primitive societies used a lot of decoration and the most advanced societies had no superfluous ornament unless it had a purpose. In the essay Loos used the example that a European man who tattoos himself is either a criminal or a degenerate; if a tattooed man dies out of prison, he reasoned, it was only because the man did not live long enough to commit his inevitable murder. Such rhetoric was typical of contemporary journalism. Le Corbusier later commented on the essay, saying that the essay was "a(n) Homeric cleansing" of architecture. In 1910, the essay entitled "Architecture," was published. Important contradictions in design between the interior and the exterior, the monument and the house, and art works and objects of function were explained. He believed that there was a difference between art and architecture, and the only things in a house that belonged to both categories were the monument and the tombstone. The house was not considered art because it had to please everyone, unlike art. The fact that architecture is essential and serves, meant that it must not be categorized as art. Surprisingly, Adolf Loos’s own architectural work was often decorative, similar to the prolific fellow Viennese architect (and leader of the Vienna Secession), Otto Wagner. The visual distinction was not between complicated and plain, but between "organic" and superfluous. American architect Frank Lloyd Wright was a notable example of an advocate of the former, despite some dubious decorative designs among some of his later projects. Adolf Loos was also interested in the decorative arts, collecting sterling silver and high-quality leather goods, which he noted for their plain yet luxurious appeal. He also enjoyed fashion and men's clothing, designing the famed Knize of Vienna, a haberdashery. Cafe Museum, at Vienna, Austria, 1898 to 1899. Wohnung Leopold Langer, at Vienna, Austria, 1901. Villa Karma, Clarens, at Montreux, Switzerland, 1904 to 1906. Wohnung Rudolf Kraus, at Vienna, Austria, 1907. Schmuckfedern-geschift Sigmund Steiner, at Vienna, Austria, 1907. American Bar, at Vienna, Austria, 1907. Wohnung Bellak, at Vienna, Austria, 1907. Schneidersalon Knize, Vienna, Austria, 1909 - 1913. House on the Michaelerplatz, at Vienna, Austria, 1910 to 1911. Steiner House, at Vienna, Austria, 1910. 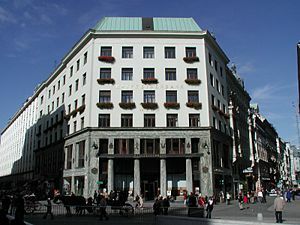 Scheu House, Vienna, at Austria, 1912 to 1913. Horner House, at Vienna, Austria, 1921. Rufer House, at Vienna, Austria, 1922. Villa Stross, at Vienna, Austria, 1922. Landhaus Spanner, at Gumpoldskirchen, Austria, 1923. Big shop (project), at Alexandria, Egypt, 1924. Tristan Tzara House, at Paris, France, 1926 to 1927. Moller House, Vienna, at Austria, 1927 to 1928. Wohnung Hans Brummel, at Vienna, Austria, 1929. Wohnung Willy Hirsch, at Pilsen, Czech Republic, 1929. Khuner Villa, on the Kreuzberg, Payerback, Austria, 1930. Villa Muller, at Prague, Czech Republic, 1930. Wohnung Leo Brummel, at Vienna, Austria, 1930. Muller House, at Prague, Czech Republic, 1930. Landhaus Khuner, at Payerbach, Austria, 1930. Bojko House, at Vienna, Austria, 1929 to 1930. Mitzi House, at Vienna, Austria, 1931. House in the Vienna Werbund, Austria, 1930 to 1932. Semler House, at Pilsen, Czech Republic, 1932. Lustenberger, Kurt. 1994. Adolf Loos. Zurich: Artemis. ISBN 187405603X ISBN 9781874056034 ISBN 3760881467 ISBN 9783760881461. Münz, Ludwig, and Gustave Künstler. 1966. Adolf Loos, pioneer of modern architecture. New York: Praeger. Tournikiotis, Panayotis. 1994. Adolf Loos. New York, NY: Princeton Architectural Press. ISBN 1878271806 ISBN 9781878271808. This page was last modified on 1 February 2019, at 21:05.